I need to stop posting nothing but bug shots. But here’s one from today: These odd little surface blemishes. In this shot, they’re all black. In others, there are some white ones, too. 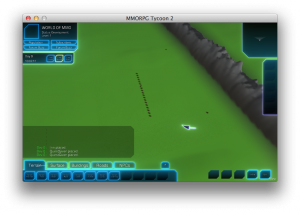 As before, this turned out to be another little glitch in my multithreaded terrain generation. In MMORPG2, generating the world terrain data happens in the background — when the game starts up for the first time, it starts generating terrain data. It uses several threads to do this; all working at the same time. Each thread works on building the data for a little rectangle of terrain. Some bits of the terrain data being generated rely on other, nearby bits of terrain data. For example, on a particularly steep slope, fields expose dirt, rather than showing grass. Sometimes that terrain data which I need to fetch (particularly when determining the surface normal, which itself affects the surface color), a thread needs to query the data being worked on by another thread. Works great, except for a minor problem; I was setting the “I’ve generated this data” flag slightly before I actually set the data. So if thread 1 needed external data and started generating it, then if thread 2 needed that data, it was possible that thread 2 would ask for the data in the brief moments between when thread 1 set the flag which set “this data has been generated!” and when it had actually stored the data. Which resulted in thread 2 grabbing data which it thought was set, but actually wasn’t. Which led to artifacts like those shown above; little single-vertex-wide glitches, mostly along the edges of the blocks of terrain during initial terrain generation. By switching the terrain generation to set the generated terrain values *first*, and the flag stating that the terrain values had been set *after*, this problem has now gone away. 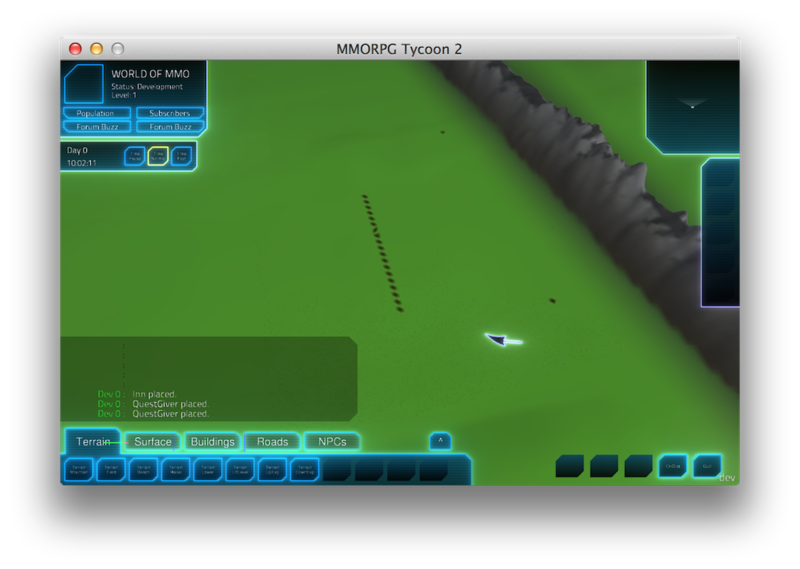 23 September, 2013 in Full Games, MMORPG Tycoon.